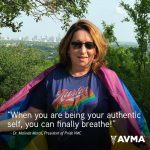 LGBTQ+ collaboration between the AVMA and Pride VMC continues in July, with Pride VMC hosting a town hall at AVMA Convention 2018 on July 14 in Denver. Titled “Be Your Authentic Self,” this group discussion will allow LGBTQ+ veterinary professionals to learn from their colleagues how they deal with stigma, barriers and personal empowerment in practice. Pride VMC will also host its board meeting, as well as its annual meeting and networking reception, at AVMA Convention 2018 on Saturday, July 14, from 5-7 p.m. This will be followed by AVMA’s inaugural “Live Life, Love All” event from 7-11 p.m. at the Hard Rock Cafe Denver, a celebration of the diversity of the profession featuring live music by the Barkin’ Cats, a DJ and refreshments.